I've had these guys since they came out, and delayed painting them due to loads of defects on the models. 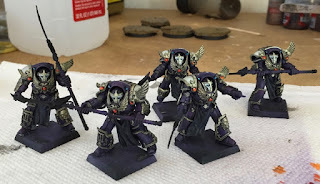 To make thinks worse, I had forgotten the painting recipe for my EC purple. So with defective models, and little chance at replicating the color scheme, I dove right in with limited expectations and no stress. Somehow, I got the scheme right. I don't know what painting gods decided to help me out, but thanks. There is a lot of shading work to do now, but I am happy with the progress so far. At least I hope those were the colors! They are looking nice so far. Love those models. What defects did you have? Many of the gems have holes in them, and the gold trim areas are not all there. It looks like the models were made without enough resin. I probably could have taken care of this years ago, since forgeworld customer service is so good, but I didn't. Those turned out looking lovely! Always loved those models, but have heard others say the casts tended to be a little rough. Good stuff, man! Outstanding painting! Truly worthy of the Emperors Children. YES YES YES YES YES YES EMPERORS CHILDREN!! YES! I like your EC paint scheme more, but it is too late to change mine.